The Schusterman Center's Summer Institute for Israel Studies is a one-of-a-kind program dedicated to expanding Israel studies on a global scale. The Summer Institute for Israel Studies welcomes tenure-track faculty from the U.S. and around the world to a two-week residency at Brandeis. During this time, Summer Institute for Israel Studies fellows attend seminars taught by distinguished Israel studies scholars and develop syllabi for courses they will teach upon returning to their home institutions. The residency is followed by a 10-day tour of Israel, featuring encounters with Jewish and Arab intellectuals, politicians and community leaders. After completing the program, Summer Institute for Israel Studies alumni continue to enjoy access to a trove of resources – syllabi, articles, archives, podcasts, conferences, workshops and webinars – and an ever-growing network of peers that spans the globe. 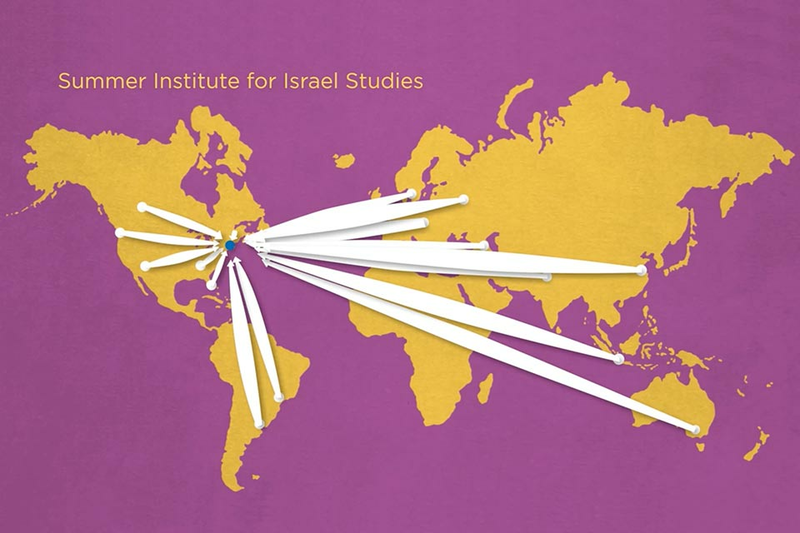 Since 2007, the Summer Institute for Israel Studies has been building a community of scholars who are integrating Israel studies into their institutions all over the world. During the first two weeks, SIIS fellows are in residence at Brandeis and participate in seminars taught by distinguished Israel Studies scholars. These seminars focus on Israel’s society, history, politics, culture, foreign affairs, and diplomacy. Fellows are then required to present syllabi for the courses they plan to teach on their home campuses. Accommodations are in shared suites at the university's newest residence halls. On a 10-day study tour in Israel, fellows meet with leading figures in public life, the academy and the arts; including politicians and civil servants, writers, public intellectuals, and Jewish and Arab community leaders. Fellows also visit select historical and cultural sites. Participation in this portion of the Summer Institute is highly recommended but optional. Group flight travel from the US to Israel and back is covered. Accommodations are in single rooms in hotels. Our 2016 Israel and the Media conference included an SIIS fellows workshop with Ethan Bronner, senior editor at Bloomberg News. Our 2013 Zionism in the Twenty-First Century conference included an SIIS fellows workshop with Anita Shapira "On Constructing Narratives" using her book as a reference, Israel: A History. Our webinar series for that academic year included discussions about Israel's recent election, its post-1948 visual landscape, and the politics of the Arab sector. Fellows have come from nearly 200 universities in the United States and around the world. Institutions range from small liberal arts colleges, to Jewish and Christian academic institutions, U.S. military academies, large research universities, and the Ivy League. Summer Institute fellowships are open to faculty members in the humanities and social sciences teaching outside of Israel. Applicants must be actively teaching at a college or university that has approved their plans to introduce a new course on Israel Studies or to substantially integrate it into an existing course. The deadline to apply for SIIS 2019 is January 31, 2019.